Interferon, gamma-inducible protein 16, also known as IFI16, is a human gene. This gene encodes a member of the HIN-200 (hematopoietic interferon-inducible nuclear antigens with 200 amino acid repeats) family of cytokines. The encoded protein contains domains involved in DNA binding, transcriptional regulation, and protein-protein interactions. The protein localizes to the nucleoplasm and nucleoli, and interacts with p53 and retinoblastoma-1. It modulates p53 function, and inhibits cell growth in the Ras/Raf signaling pathway. 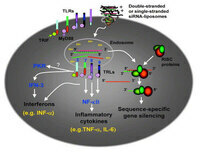 IFNs alpha and gamma both induce IFI16 mRNA expression in myeloid cells. Immunohistochemical expression analysis of the human interferon-inducible gene IFI16, a member of the HIN200 family, not restricted to hematopoietic cells. 2002 Palestro G normal adult human tissues, it is prominent in stratified squamous epithelia and particularly intense in parabasal cells in the proliferating compartments, but it gradually decreases in the more differentiated suprabasal layers. overcoming the block of the activity of other transcription factors by inhibitor of differentiation (Id) proteins. Much remains to be learned about p204, particularly with respect to its expected involvement in the differentiation of several as yet unexplored tissues. IFI16 is a member of the HIN-200 family (hematopoietic interferon-inducible nuclear antigens with 200 amino acid repeat) that contains a DNA binding domain, a transcriptional regulatory domain, DAPIN/PAAD domain associated with interferon (IFN) response and a binding domain for BRCA1, breast cancer tumor suppressor protein. IFI16 has been identified as a target of IFNa and g and is a member of the HIN-200 family. Although series of initial studies have demonstrated a potential activity of IFI16, a physiological role of the protein was largely unknown. A novel insight of the function of IFI16 stemmed from the observation that IFI16 constitutively binds to BRCA1 breast cancer tumor suppressor. Furthermore, it has been demonstrated that IFI16 is involved in p53-mediated regulation of cell growth and apoptosis. Immunocytochemical and immunohistological analyses of breast cancer cell lines and specimens revealed that levels of IFI16 are frequently decreased, supporting the notion that loss of IFI16 is closely associated with tumor development. Finally, siRNA-mediated depletion of IFI16 induces levels of NBS1, nijmegen breakage syndrome protein 1, leading to activation of DNA-PK (DNA-dependent kinase), phosphorylation of p53 Ser37 and accumulation of p21WAF1. Localization of IFI16 is determined by the status of BRCA1 protein under conditions of DNA damage, such as ionizing radiation (IR). More recently, it has been shown that levels of IFI16 are increased by oxidative stress. Together, these results illustrate that IFI16 is involved in DNA damage signaling and cell cycle checkpoint. The human IFI16 gene is an interferon-inducible gene implicated in the regulation of endothelial cell proliferation and tube morphogenesis. This gene is highly expressed in endothelial cells in addition to hematopoietic tissues. IFI16 a nuclear protein that may function as a transcriptional repressor. Could have a role in the regulation of hematopoeitic differentiation through activation of unknown target genes. Controls cellular proliferation by modulating the functions of cell cycle regulatory factors including p53 and the retinoblastoma protein. Three alternatively spliced isoforms have been described. Subunit: Isoform 1, isoform 2 and isoform 3 can homo- and hetero-dimerize. Binds double-stranded DNA and cell cicle regulatory factors including p53 and the retinoblastoma protein, pRb. IFI16 directly binds p53 at the first 200 amino acid repeat region. It is proposed that IFI16 functions as a negative regulator of p53, that participates in p53-mediated transcriptional activation of its down-stream target genes involved in cell cycle regulation. It is well-established that in normal growing cells, p53 levels are kept low through proteasome-mediated degradation promoted by the ubiquitin-ligases Mdm2 and/or Pirh2. However, when cells are exposed to a stress that leads to DNA damage, p53 becomes rapidly stabilized and functionally activated as a consequence of post-translational modifications, and the p53 protein functions as a transcription factor capable of binding DNA in a sequence-specific manner and transcriptionally regulating genes involved in cell cycle. It is not established the specific mechanism(s) that regulates the IFI16-mediated regulation of p53, but it is possible that the binding of IFI16 to p53, as in the case of the binding of Mdm2 to p53, is necessary for maintaining low levels of p53 in the normal cell. IFI16 binding to p53 in the nucleus hinders p53 binding at the p21 promoter such that the removal of IFI16 results in increased p53 binding at the p21 promoter leading to increased transcription of p21. Therefore, IFI16 may directly or indirectly affect p21 protein stability. This gene encodes a member of the HIN-200 (hematopoietic interferon-inducible nuclear antigens with 200 amino acid repeats) family of cytokines. The encoded protein contains domains involved in DNA binding, transcriptional regulation, and protein-protein interactions. The protein localizes to the nucleoplasm and nucleoli, and interacts with p53 and retinoblastoma-1. It modulates p53 function, and inhibits cell growth in the Ras/Raf signaling pathway(protein). IFI 16 inhibits cell growth in the Ras/Raf signaling pathway. IFI16 is a downstream target of the LIF/JAK/STAT pathway. It is shown that IFI16 is essential and sufficient for the LIF/JAK/STAT-induced growth arrest in medullary thyroid carcinoma cells, but is not required for differentiation, which is also induced by the LIF/JAK/STAT pathway along with growth arrest. Thus, IFI16 appears to be specific for cell cycle regulation mediated by the cell-extrinsic LIF/JAK/STAT pathway and separates the regulation of growth arrest from that of differentiation. IFI16 is then defined as an essential growth specific effector of the LIF/JAK/STAT-mediated cell-extrinsic pathway of Ras/Raf. In this study, gene array analysis of human umbilical vein endothelial cells overexpressing IFI16 revealed an increased expression of genes involved in immunomodulation, cell growth, and apoptosis. Consistent with these observations, IFI16 triggered expression of adhesion molecules such as ICAM-1 and E-selectin or chemokines such as interleukin-8 or MCP-1. Treatment of cells with short hairpin RNA targeting IFI16 significantly inhibited ICAM-1 induction by interferon (IFN)-γ demonstrating that IFI16 is required for proinflammatory gene stimulation. Moreover, functional analysis of the ICAM-1 promoter by deletion- or site-specific mutation demonstrated that NF-κB is the main mediator of IFI16-driven gene induction. NF-κB activation appears to be triggered by IFI16 through a novel mechanism involving suppression of IκBα mRNA and protein expression. The reiterated domain structure of IFI16 protein is closely reflected in its intron/exon boundaries, and may represent the evolutionary fusion of several independent functional domains. Thus, exon 1 consists of 5' untranslated (UT) sequences'_UTR and contains sequence motifs that may confer interferon-inducibility, and exon 2 encodes the lysine-rich amino-terminal ( K ) region, which possesses DNA-binding activity. Exon 3 codes for a domain which is poorly conserved between family members, except for a strongly retained basic motif likely to provide nuclear localization. The first of two 200 amino acid repeat domains that are the hallmark of this family (domain A) is represented jointly on exons 4 and 5, which are reiterated as exons 8 and 9, respectively, to encode the second 200 amino acid domain (B). Two intervening serine-threonine-rich domains (C and C'), unique to IFI16, are each encoded by single exons of identical length (exons 5 and 6). These domains are predicted to encode semi-rigid spacer domains between the 200 amino acid repeats. The reiterated nature of exons 4 to 6 and the insertion of introns into a single reading frame strongly suggest that IFI16 and related genes arose by a series of exon duplications, some of which antedated speciation into mouse and humans. Several alternative mRNA cap sites downstream of a TATA consensus sequence were defined, using primer extension analysis of mRNA. Inflammation and immune system activation are characterised by the synthesis of specific proteins that play crucial roles in the defense of the organism against pathogens and the modulation of immune response. Acute-phase proteins (APP) such as fibrinogen, C-reactive protein and haptoglobin are synthesised and secreted by the liver through induction of IL-1 and particularly IL-6. IFI 16 is involved in inflammation, but is not one of the first line proteins synthetised during inflammation. The fact that IFI 16 protein lacks in tryptophane is an evidence that inflammation and immune system activation are associated with disruption of several metabolic pathways and modifications of nutrient utilisation. By comparing the amino acid composition of the different acute-phase proteins, most of these proteins are rich in aromatic amino acids (phenylalanine, tyrosine and tryptophan) relative to muscle protein (Table 1). During inflammation, acute-phase protein plasma concentrations can increase 2- to 100-fold depending on the protein. Evidence shows that tryptophan plasma concentration declines in human (Brown et al., 1991; Preston et al., 1998), pigs (Lindberg and Clowes, 1981; Melchior et al., 2002) and mice (Saito et al. 1992) suffering from different illnesses and inflammation (induced or natural), suggesting an increased utilisation of the amino acid in such situations. Can be suspected that the tryptophan requirement for acute-phase protein synthesis is high (Reeds et al., 1994; Preston et al., 1998). and is preferentialy used to synthetize protein whose activity is more necessary. To sum up, the activation of particular metabolic pathways leads to specific amino acid requirements.